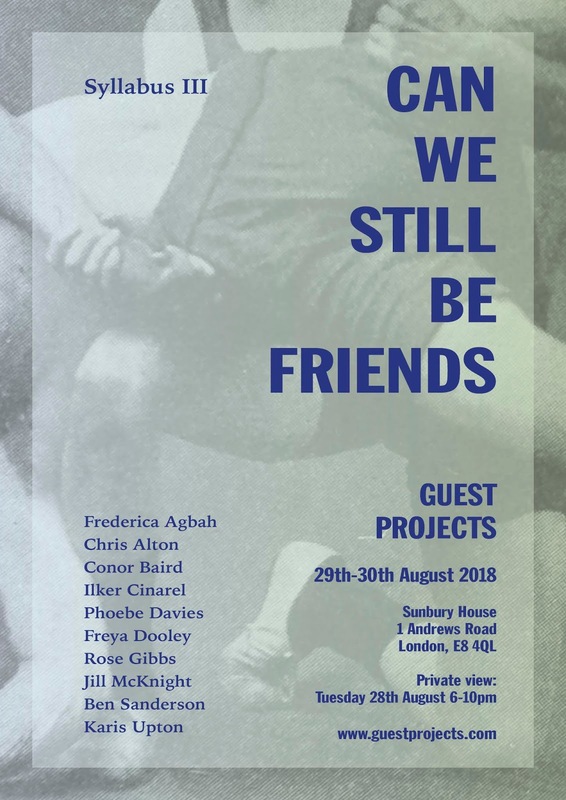 Can We Still Be Friends responds to the polyphony, the push and pull, the joy and tension of solo and collaborative practices as they rub up against one another. This exhibition is the culmination of the arranged marriage that was Syllabus III. It brings together ten artists from disparate parts of the UK who didn’t choose each other, but after 10 months of intense and immersive weekend retreats, they became close. They worked, talked and made things together, danced, wined, dined, cried a bit and then broke up after a year. Breaking up is hard to do. Syllabus III is a collaboratively produced alternative learning programme jointly delivered by Wysing Arts Centre, Eastside Projects, Iniva, New Contemporaries, S1 Artspace, Spike Island and Studio Voltaire. For more information about The Syllabus, click here. The Syllabus is supported by Arts Council England and the Fenton Arts Trust. Guest Projects is an initiative conceived by Shonibare Studio to offer the opportunity for artistic practitioners, of any artistic discipline (dance, visual arts, music), to have access to a free project space. Alongside Regent’s Canal, Guest Projects at 1 Andrews Road E8 4QL, provides an alternative universe and playground for artists. It is a laboratory of ideas; a testing ground for new thoughts and actions.